2-402 pair of handmade and painted sconces, takes one 60 watt bulb. 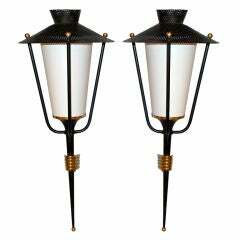 2-500 pair of scrolled black iron wall lanterna. Each sconces accepts one candelabra base bulb, 60W-max. Newly rewired. Age appropriate wear. 2-421ab pair of French brass and acrylic sconces Takes 60 watt candelabra base bulb Two pair available priced per pair. 1920s American mirrored back sconces, by Caldwell. With etched ships on backplates, polychromed and with gilt details. Measurements: 17" height 5.5" wide 5.5" depth. Pair of 1940s brass sconces with glass hurricanes. Original patina, with glass hurricanes. 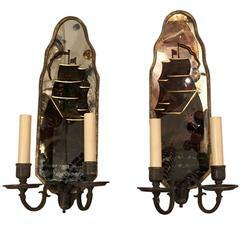 Pair of large English patinated brass sconces with adjustable shades, single light. A pair of circa 1920s American cast iron sconces with original painted finish, decorated with sail ship. A matching pair of French 1950's tochere lantern sconces produced by Arlus, design attributed to Mathiue Mategot. Matte black enamel and polished brass wall mounts. This wonderfully reflective brass and glass sconce features a look that is both Industrial and nautical. This sconce would bring an adventurous seafaring vibe to any space!